The Los Angeles quartet started garnering major buzz when they released their newest single in the early fall "Undertow" off their upcoming full length titled, The Fool. As a whole the album continues down those same slightly jumbled streets that "Undertow" hinted at which might best be described as off-kilter-dreamy-art-pop. The mix that these woman, Emily Kokel (Vocals/Guitar) Thersea Wayman (Vocals/Guitar) Jenny Lee Lindberg (Bass/Vocals) Stella Mozgawa (Drums/Keys/Vocals), produce is engaging because it seems to never be comfortable in its own sound. When "Bees" is seemingly ready to fall apart, with the individuals in the group venturing out on their own, it surprisingly finishes strong by coalescing around a "Da-Da" singalong, then tacks on a programed drum ending that confuses. It is not that these songs spasmodically jump around (ala Man Man) more likely the band had varying ideas and weren't afraid to combine them into 5 minute tunes, to varying degrees of success. The most straightforward song is the ballad "Baby" which is presented in a siren-like vocal arraignment cutting deep with its lyrical refrain "Don't you call anybody else Baby". The finale of "Lissie's Heart Murmur" adds a dramatic piano procedure to the group that fits swimmingly amongst the waves of lyrics and cymbals. 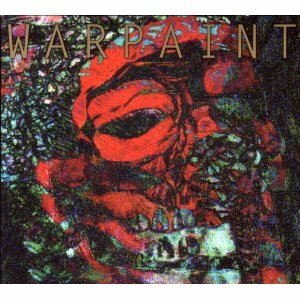 The vocals on The Fool act as another instrument in the mix and at times they can become a bit distracting, but the floating style and hazy production certainly seems woven into the fabric of Warpaint. Another minus is a drum sound which flirts to closely with machine pre-programmed nonsense; a more organic/grounded sound on the kit would keep the vocals from lifting the songs a float with too much airiness. That stated, tracks like the opener "Set Your Arms Down", the all over the map "Warpaint" and that arresting single "Undertow" do enough to hook ears, making The Fool anything but foolish. I was first turned onto Warpaint via "Elephants" back in the beginning of 2010 off of their EP Exquisite Corpse and I meant to get this review posted last month, but things happen. It was an album that I have been listening to a bit, but I had a hard time coming up with a major conclusion on. There are a lot of layers here to sift through and in complete honesty, while the vocals are well sung I think they are too distracting, I would rather hear the Ladies focus some more on the odd sounds and sonics that they produce. Everyone can sing but this hazy, floating vocal tone doesn't really do it for me. I do love the bass playing on this album and I think a different producer would get me into this more, but who knows?! You can stream the full album right here and judge for yourself!